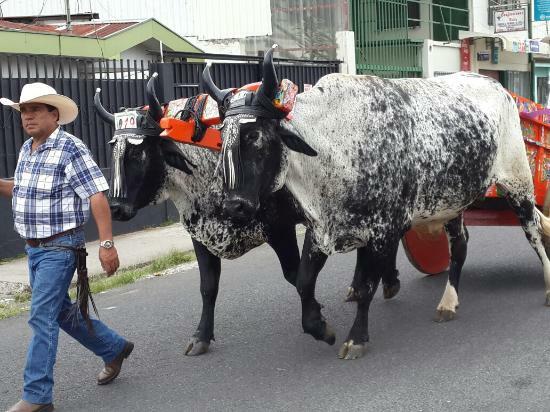 TICO BULL – The Dia de la Virgen de Los Angeles (Day Of Our Lady of Angels, in English) or La Negrita, as she is commonly referred to, is a big deal in Costa Rica, regarded as the third most important religious holiday in the country, after Christmas and Easter or Semana Santa. This is the day that everyone is talking about and/or making their way to Cartago, on foot, bicycle, bus (now train) or car. And you don’t have to be Catholic or religious, anyone can participate. I have done it in the past, no, not the walk, I drove, walks a few blocks from the parking lot, saw and then headed home. Usually the afternoon of the 2nd (of August), when by that time the crowds had thinned out. No way was I going to be there in the middle of a crowd of hundreds of thousands, almost two million if you can believe official figures. By the way, this year, the rethoric is “more than a million”, uhm a big drop. Either the Catholic church has dropped the ball on their marketing or are using a new algorithm in their count. But, I think that it, the fewer numbers, has more to do with the day falling on the weekend. August 2 is a public holiday, but a “no pago obligatorio”, that is you can take the day off work legally. And since it doesn’t fall between Tuesday and Friday, the holiday doesn’t get move to the next Monday. So, August 2 this year being a Saturday and most don’t work on a Saturday, there is no taking the day off work to go to Cartago. Which, in my opinion, reflects the low expected head count. The same “no pago obligatorio” applies on October 12. But I digress. Typically the massive collective arrives Friday night, around midnight. Some, after a short stay, head back home, others camp out for the night, keeping a vigil, while for many others its “party time”. Whatever your reasons, if you have never participated in a Romeria, do so and in the manner it works for you. And if you have never been to the Basilica in Cartago, put it on your bucket list. If you do decide to walk to Cartago, be prepared, especially if you are not a walker. Most don’t walk all the way from home, they drive, bus it, taxi it, bum a ride to Tres Rios and then walk the rest of the way. Carry lots of water or cash to buy liquids along the way. Bring a jacket or sweater, it gets cold in Cartago, especially at night. Carry an umbrella, remember we are still in the rainy season. Bring along snacks or cash to buy eats, you will get hungry. Travel with a friend or group, never alone. Have a flashlight. Forget about your cell phone flashlight, you are setting yourself up. On that, carry a cell phone, but a cheapie in case it gets lost or damaged and won’t make you a target. First aid is available, don’t be a wuss to not rest or ask for help. Have your return trip planned. Most forget about how to get back and then are scrambling for the limited public transport back to San José. Me, not sure yet if I am going to Cartago, but, if I do, as in the past, it won’t be on foot.